We know you're just going to love staying with us at Siam Bayshore Resort, the ideal place for total relaxation. Nestled on the quiet southern tip of Pattaya Bay, guests staying at the resort are peacefully secluded in tropical gardens, yet enjoy the convenient location which is just a short stroll to town via the Beachside Promenade. From the comfortable rooms to the casual resting places, we have thought of everything that you need to escape from the world. The 270 rooms are housed in 12 inter-connected wings that dot the 40 acres of luscious gardens. Come to breakfast at your leisure, then laze around one of the pools soaking up the sun, go off sightseeing, playing sport, shopping or whatever takes your fancy. In the evening, you can sit outside and enjoy the sumptuous nightly BBQ with ocean views or get dressed up and have a romantic dinner at one of the restaurants. The choices of how to fill each day are endless and our friendly staff are waiting to be of assistance. A total of 270 rooms and suites are located within this uniquely designed hotel comprising 12 connected wings amidst 20 acres of lush tropical gardens. All of the spacious rooms are designed to blend in with the Asian tropical setting and to provide an atmosphere of ultimate relaxed comfort. Perfect for the discerning traveler with larger rooms and extra services. The Ocean Wing is just four stories high, impressively designed with an atrium in the middle and is the heart of the hotel where the lobby and restaurants are located. The Ocean Wing houses 45 rooms and 9 suites, each with balconies angled to give every room a view of the sea or the garden. 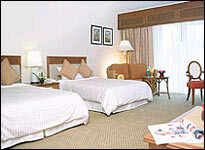 The newly refurbished rooms provide luxurious comfort and the decor is elegantly Thai making it all the more charming. 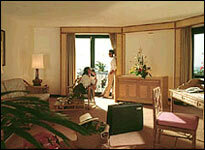 There are a total of 9 suites located at each of the three corners of the Ocean Wing. All are very spacious ( 98-124 sq.m.) 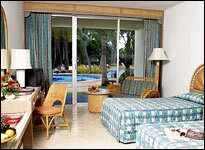 with two queen-size beds, 2 bathrooms, a large living room, dining area and pantry. 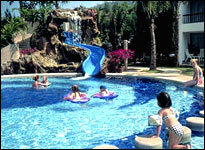 The residential atmosphere makes them perfect for extended stays with the family. In the gardens, 11 smaller pavilions meander through fountains, lagoons and gardens accompanied by the sounds of singing birds. The 216 rooms here all have northern Thai terra-cotta flooring and the atmosphere is of extreme tranquility blending in perfectly with the peaceful surroundings. A special 110 volts outlet for electric shavers is provided in the bathroom. Located in the Main Lobby, our delightful coffee shop overlooking the ocean offers a wide range of Thai and international cuisines. A delicious buffet breakfast is served here every morning from 6.30 a.m. to 11 a.m. Also a great place to sit and have coffee and cake at anytime of the day. Located off the Main Lobby, Camillo is ideal for an intimate candlelit dinner with delicious Italian and European specialities including mouth-watering steaks, delicious seafood, and a fine selection of wines. 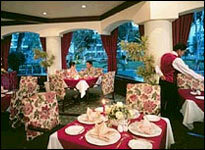 Open daily 6.00 p.m. – 11.00 p.m.
For over 20 years, Bali-Hai has been synonymous with the art of fine Chinese cuisine. The Chef’s culinary artistry has been matched only by the restaurant’s breathtaking view of Pattaya Bay. House specialties feature popular dishes from Szechuan and Shanghai and the best Peking Duck in Town! Private rooms are available for special occasions, while the outdoor verandah (Beach Club), with a pleasant evening breeze is great for a more casual atmosphere. 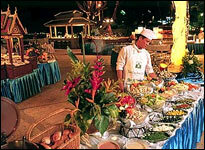 This outdoor beachside area transforms into a fun and exciting barbecue where guests can enjoy a variety of fresh grilled seafood and succulent meats, a variety of Asian delights, salads and international main courses, and divine desserts with an exotic cocktail or an ice-cold beer. There is live music to entertain you and a special nightly show performed by the staff. 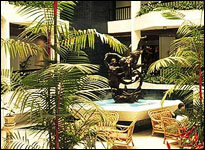 Casual, comfortable and elegant, The Greenery is the charming attraction of our Ocean Wing. Surrounded by hundreds of lush tropical plants, it is the perfect place to relax and unwind after a warm day on the beach. Enjoy your favourite cocktail in the indoor garden setting, featuring live entertainment six evenings a week. Open daily 8.00 a.m. – 01.00 a.m. Located in front of the Ocean Wing by the sea, enjoy our seaside private Beach Club where light snacks and cool drinks are served around the pool area. 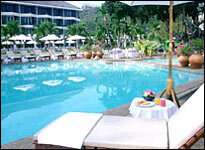 Open daily 8.00 a.m. – 6.00 p.m.
You don’t even have to leave the pool area to enjoy a snack or a full meal. Bask in the sun or relax in the shade while enjoying a light snack, quick lunch or a nice long cool drink throughout daylight hours. 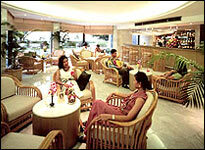 Located off the Main Lobby, the serene atmosphere is ideal for a soothing evening cocktail. You can relax in elegant surroundings or view the sunset from the outside terrace. Enjoy a delicious relaxed meal in the comfort of your room. 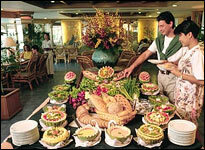 An extensive “Room Service Menu” includes breakfast, lunch, dinner and light snacks.